I tagged along with a friend last weekend in his search to rediscover a favorite very early spring wildflower. 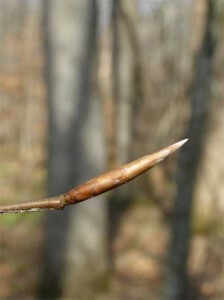 Along the way, he came to an abrupt halt, admiring a single long, smooth bud, appearing like a spear tip. He immediately recognized it as the deciduous umbrella magnolia, Magnolia tripetela. You may spot it down along your favor creek or river path. Remember its location, because you will want to go back in the middle of spring to admire the large leaves clustered at the ends of the branches like an umbrella. The flowers are often missed because of the freshly emerged foliage of other trees all around. So, in spite of early signs of spring, we still have several weeks to practice winter botany. I have a favorite memory of a summer botanical survey in the early 1970s. I was assisted by a young couple who had taken a basic plant identification class. I noticed the young woman was carefully pulling all the leaves from a twig in her hand. Her response to my obvious inquiry was: “I have to get rid of all these confusing leaves because I learned to identify plants in the winter.” She was serious and, furthermore, once she had the twig in hand, bare of leaves, she was able to identify it. And so it is that plants can often be easily identified in the winter. Striking contrasts of bark and shapes of trees are obvious identifying features. Less often appreciated are the buds. Another distinctive bud we noticed on last weekend’s excursion was the smooth, duck bill-like bud of a magnolia relative, the handsome tulip poplar, Liriodendron tulipifera. You can begin looking high up in the trees for beautiful green and yellow tulip-shaped flowers in mid-April. 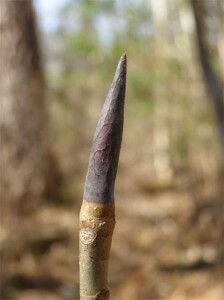 Beech trees, Fagus grandifolia, easily known by their smooth trunks and for holding onto their copper-brown leaves, have a long narrow copper-colored spear-point bud at the ends of horizontal branches. Keep an eye on those buds and observe how the old leaves are pushed off overnight on or just before April 1. That time clock is predictable. Red maples, Acer rubrum, are easily recognized by those deeply red-colored twigs sporting red buds at the tips and oppositely arranged along the sides. The closely related southern sugar maple, Acer barbatum, is similar, except it is brown rather than red. If you’re really lucky, you may discover a grove of pawpaws, Asimina triloba. 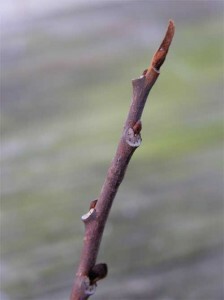 Pawpaw buds are distinguished by the exposed young leaf protected with dark, velvet-like hairs. Further down, there may be a similarly textured fat, round flower bud. Definitely go back during late March and early April to see those pawpaw flowers. 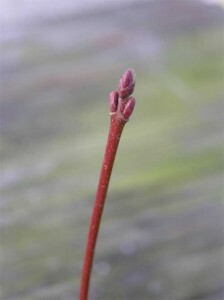 Obviously, there are many more buds out there, each beautiful and interesting in distinctive ways. 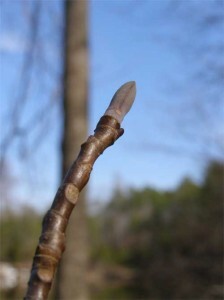 On your next woods walk, take time to “take a closer look” at the buds. And take that walk soon, because before long we won’t be able to see the forest for the leaves. Buds (in order top to bottom) of tulip poplar, American beech, red maple and pawpaw (Photos by Ken Moore).